Settled in the late 1870s, it may have been in anticipation of the Missouri, Kansas and Texas Railroad that arrived in the 1880s. The name is said to acknowledge the clay of the area – a soft red clay that townsfolk fired into bricks. A kiln built in 1880 provided the construction material for the Rains County courthouse in nearby Emory. In 1905 a larger company started making bricks marked with the name Ginger. The company switched to tile manufacturing until the clay deposits ran out. 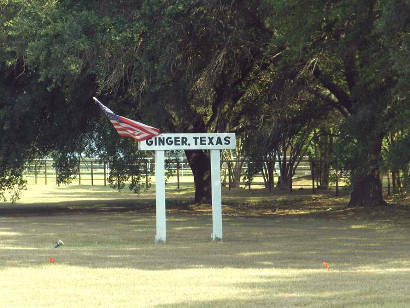 Ginger didn’t receive a post office until 1910 when the population was estimated to be 100. It rose to 150 by 1920 but the Great Depression took its toll and by the end of WWII there were only fifty residents. 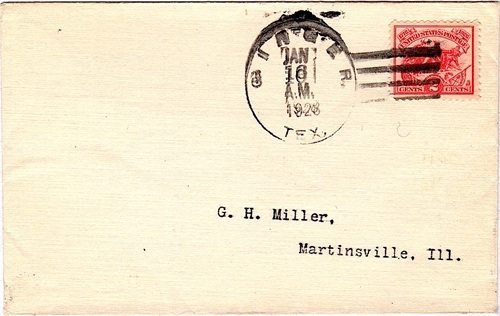 The post office closed in 1930 and thereafter mail was routed through Alba. The figure of 96 was used as a population estimate for both the 1990 and 2000 census. "Some proud homeowner wants to keep the memory of Ginger alive. 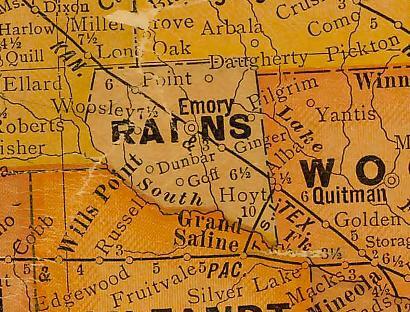 It is on US 69 about 3 miles SE of Emory and still on my maps."